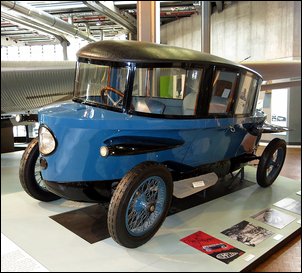 This is the world’s first aerodynamic production car – the Tropfenwagen. 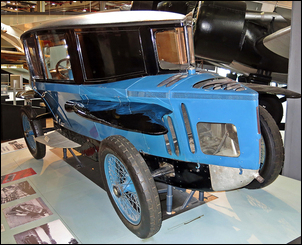 Developed by Edmund Rumpler in 1921, it not only incorporated extreme low-drag design but also used an innovative 6-cylinder, W-configuration mid-mounted engine and had independent rear suspension. 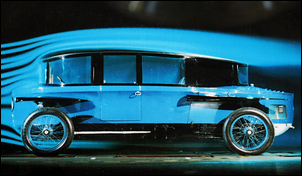 So what is the story of this car – and the man who designed it? 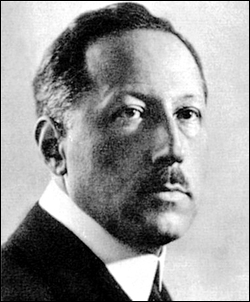 Edmund Rumpler was born in 1872. 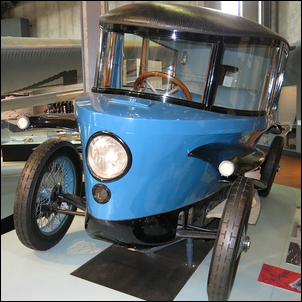 He was an Austrian automobile and aircraft designer who carried out most of his work in Germany. After studying engineering, Rumpler joined Daimler in 1898 as a car designer, then in 1902 moved to Adler becoming, at the age of just 30, technical director of that car company. 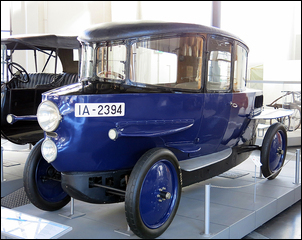 Here he designed the first German car where the engine and gearbox were mounted together as a unit. 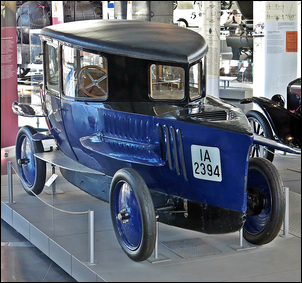 In 1903, he patented a swing axle rear suspension design. After the Wright Brothers invented the aircraft, Rumpler’s attention turned to aircraft design. 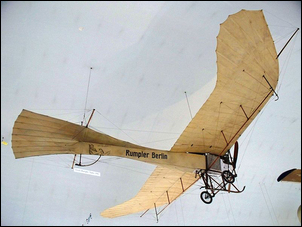 He left Adler in 1907, and in 1910 Rumpler became the first aircraft manufacturer in Germany. The most famous aircraft produced by the Rumpler company was the Taube, based on a design by Igo Etrich. Subsequently, the company went on to produce a range of aircraft of its own design. It achieved this low drag by a number of measures, all carefully tested beforehand by Rumpler working with models in a wind tunnel. 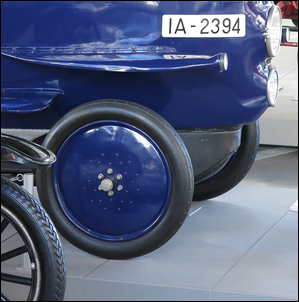 Disc wheels were used on most of the cars, rather than the exposed wire spoke wheels then universal. 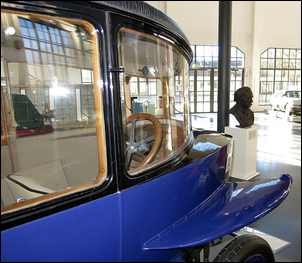 The windscreen and side windows were formed from glass panels curved in a single plane – another world first for a car. The degree of curvature of the windscreen was radical. 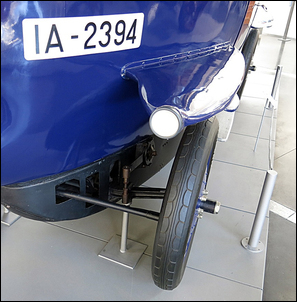 Mudguards, instead of being curved to match the wheels, were straight and mounted horizontally, giving a very small frontal area. The lights were integrated into the aerodynamic shape, rather than being drag-inducing add-ons. However, the most radical aerodynamic innovation was the ‘tear drop’ plan-view shape. 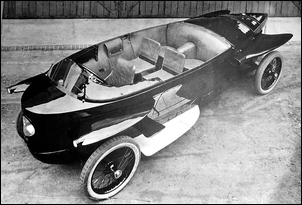 The boat-tailing was so extreme that the body work reduced in width to form a trailing vertical edge, where the exhaust pipe was placed. Mirroring this boat-tailing of the main body was the cabin, that also boat-tailed to a trailing vertical edge. 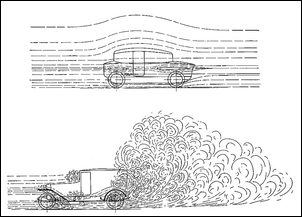 This illustration, from a Rumpler advertising brochure, compares the aerodynamic wake of a Tropfenwagen with a contemporary car. And it’s not just advertising spin: at the time, a typical car had a drag coefficient of about 0.6! In addition to the extreme tear-drop shape when viewed from above, the Tropfenwagen also tapered a little in height towards the rear. Again this is shown in a comparison made in a contemporary advertising brochure. Incidentally, note that in both brochure shots, the turbulence drawn for the conventional car has a lot of artistic license, with turbulence shown where it is unlikely to have actually occurred (eg in front of the radiator grille). 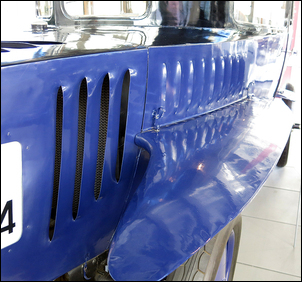 A further radical change over all other cars of the time was the use of a smooth undertray and a rear diffuser. 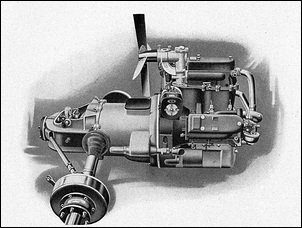 The engine, in unit with the gearbox (really a transaxle), was placed ahead of the rear wheels. 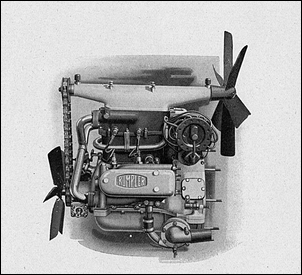 An engine-driven fan pushed air through the rear-mounted radiator. In this photo, the radiator can be seen mounted behind the engine. 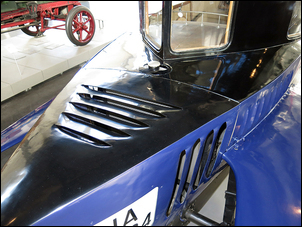 Note also the louvered exits for the cooling air, and how the louvers have been angled so that this cooling air doesn’t disrupt the airflow over the bodywork. The intake louvers for the radiator can be seen here. The engine was built by the Siemens and Halske company. It used a W-design with three banks of paired cylinders displacing 2580cc. Power output was 26kW. 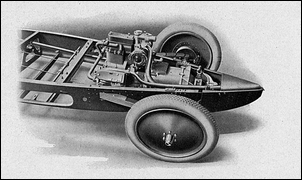 The independent, swing-arm rear suspension used long, trailing cantilever leaf springs that were angled outwards and joined the axles near the hubs. 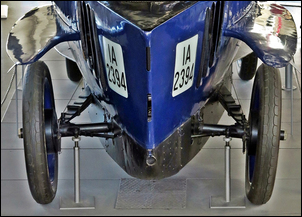 Further rear wheel location was provided by angled rods mounted behind the axles. 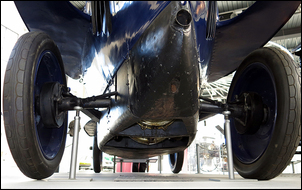 Along with the wheels, the rear suspension was fully exposed to the airflow. A recent reference suggests that the drag penalty of not enclosing the wheels may have been as high as 50 per cent. 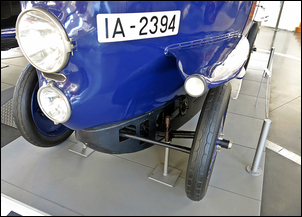 The front suspension used a non-independent beam axle sprung and located by leading cantilever leaf springs mounted parallel with the body. These springs attached to the axle well inboard from the wheels and so must have provided very little front roll stiffness. The Tropfenwagen was a genuine production car – but it was not a commercial success. The W-engine had problems, the steering could shimmy, and the first versions of the car did not have a boot. 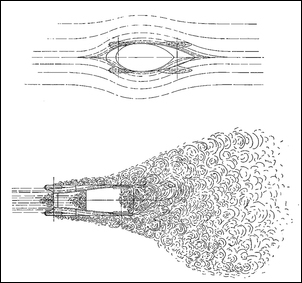 Roads on which cars could travel at higher speeds had not yet been developed, and so the aerodynamic advantages weren’t reflected in improved fuel consumption. 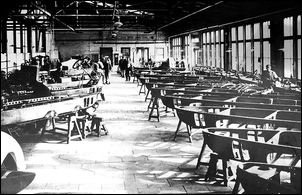 One hundred of the cars were built, of which only two now remain. 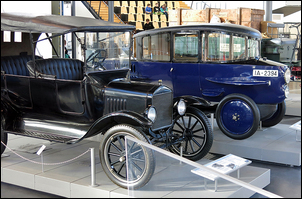 Both are on display in German technical museums. The Tropfenwagen was available in at least four different versions. 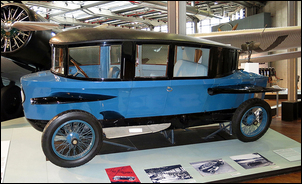 Shown here is a 5-seat, long wheelbase, open car that used a more conventional 2614cc in-line four-cylinder engine developing 37kW. Note also the wire wheels and the different side air intake. All cars used a single, central seat for the driver. In the photos shown in this story, the lighter blue car is the long wheelbase model and the dark blue car, the short wheelbase. After the Tropfenwagen failed in the marketplace, Rumpler returned to aircraft. Rumpler was Jewish, and he was imprisoned after Adolf Hitler came to power in 1933. He was soon released but his career was ruined. He died in 1940. It is only when you see the Tropfenwagen next to a conventional car of the time that you can fully appreciate the radical nature of the Rumpler machine. 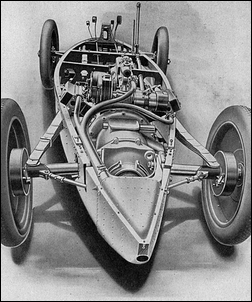 The Tropfenwagen may have been a commercial failure, but its swing axle rear suspension, mid-mount engine and transaxle, and aerodynamic design helped create the path followed by the later Auto Union racing cars of the 1930s.